ZEN BUDDHIST STORY: " MAYBE SO, MAYBE NOT"
STORIES: " ARE YOU THE CARROT, THE EGG, OR THE COFFEE BEANS"? Step Out of Your Comfort Zone. Live a Happier Life. In ancient tradition many teachings were conveyed through storytelling.This famous (Taoist ) Zen Buddhist story demonstrates a philosophy of life. The Farmer's Son: Fortune or Misfortune? Soon after, neighbors from the nearby village visited, offering their condolences and said, "What a shame. Now your only horse is gone. How unfortunate you are!". You must be very sad. How will you live, work the land, and prosper?" The farmer replied:" Maybe so, maybe not" (or "who knows, we shall see"). Two days later the old horse came back now rejuvenated after meandering in the mountainsides while eating the wild grasses. 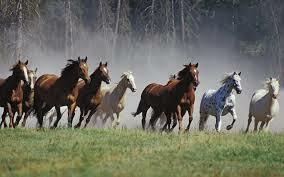 He came back with twelve new younger and healthy horses which followed the old horse into the corral. Word got out in the village of the old farmer's good fortune and it wasn't long before people stopped by to congratulate the farmer on his good luck. "How fortunate you are!" they exclaimed. You must be very happy!" Again, the farmer softly said: "Maybe so, maybe not....Who knows? We shall see." At daybreak on the next morning, the farmer's only son set off to attempt to train the new wild horses, but the farmer's son was thrown to the ground and broke his leg. One by one villagers arrived during the day to bemoan the farmer's latest misfortune. "Oh, what a tragedy! Your son won't be able to help you farm with a broken leg. You'll have to do all the work yourself, How will you survive? You must be very sad". they said. Calmly going about his usual business the farmer answered, "Maybe so...maybe not ...Who knows? We shall see". Several days later a war broke out. The Emperor's men arrived in the village demanding that young men come with them to be conscripted into the Emperor's army. As it happened the farmer's son was deemed unfit because of his broken leg. In the tea house, the villagers again commented "What very good fortune you have!!" as their own young sons were marched away. "You must be very happy." "Maybe so, Who knows? We shall see! ", replied the old farmer as he headed off to work his field alone. As time went on the broken leg healed but the son was left with a slight limp. Again the neighbors came to pay their condolences. "Oh what bad luck. Too bad for you"! But the old farmer simply replied; "Maybe so, maybe not...Who knows? We shall see." As it turned out the other young village boys had died in the war and the old farmer and his son were the only able bodied men capable of working the village lands. 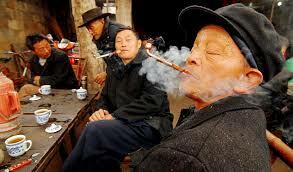 The old farmer became wealthy and was very generous to the villagers. 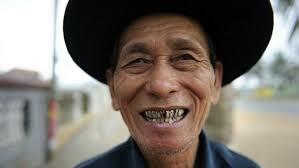 They said: "Oh how fortunate we are, you must be very happy", to which the old farmer replied, "Maybe...Who knows? We shall see!" which represents the concept of duality: good and bad, positive and negative, cold and hot, dark and light, lucky or unlucky, sorrow and happiness, fire and water. 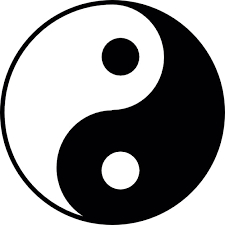 Yet, in each aspect of duality there is a dot of its counterpart demonstrating that opposite forces are complimentary, interconnected and interdependent in the natural world. Each give rise to the other and yet both are represented within the circle and they are part of the ONENESS. Oneness symbolizes the DAO or Tao, "The principle" or "The way". Everything always has both aspects, such as we cannot appreciate light without shadows and darkness. Many times we learn lessons by experiencing contrast. We appreciate our health once we have been ill, etc. This philosophy demonstrates the second principle: the principle of "non-judgment". Our "judgments" are based on our subjective perceptions and they don't encompass the full or whole view or the whole truth. There are always 2 sides of the coin in a story, so which one is right, which one is wrong? Yet they both belong to the same coin, the duality is an indivisible whole. We cannot judge any event as an end in itself, nothing is totally black or white, only time will tell the whole story. In our own lives, sometimes we see the true meaning of our experiences when we look back in retrospect and realize how the puzzle of the pieces fit together so perfectly, we understand why certain things may show up in our lives. Certain crisis or challenges that show up represent an opportunity, or a critical point we need to reach to make a positive shift or change, to move ourselves to a new level of understanding, to develop , grow and transform . Sometimes those are the "blessings in disguise" that we don't see immediately in a crisis. Sometimes taking a more moderate approach to life, making the best of the circumstances we have at hand rather than spending our time and energy "crying over the spilled milk" which leaves us stuck and stagnant in a victim's mentality, can instead lead us to a more peaceful perspective on life. The other principle taught in this story refers to the Taoist concept of "non-attachment". Most often we resist change. "What you resist, persists" or as in the Star Trek series we were told: "resistance is futile". We resist change with our egos and our wills, trying to control circumstances beyond our control, rather than allowing our deepest potential for guidance and wisdom to unfold. We become conflicted and stressed out, tension and anxiety rule over our confused minds, and an inner war restricts our connection with a greater vision. The concept of emptying the mind and opening the heart to inner wisdom, can be achieved when we leave aside our perceptions and our attachments to our version of the story. This is not about becoming "passive" but it's about becoming free from our limiting perspectives and attachments. When we have a partial vision, we indulge in our sense of righteousness, or our victimhood. In any case, we have are restricted and our vision is obstructed by seeing only the "small picture". We take the view of the ants in their little hole in the ground but those things seem so small when you take the view of the eagle. Things can change in an instant, dwelling or grasping onto things are our cause for suffering.We need to be aware of the ever changing nature of our Universe and appreciate "this moment", "the present" (that is why is called "the gift"). This is the concept of living mindfully, to live fully present in each moment; not torn apart about the uncertainty of the future or the sorrows of the past. Sit back for a moment and say to yourself: "it would be interesting to see what happens next". Trust that the "Universe is unfolding as it should" (Desiderata). Wikipedia. 2016. YIN AND YANG. [ONLINE] Available at: https://en.wikipedia.org/wiki/Yin_and_yang. [Accessed 12 June 2016]. NATT VALENTINE The Little Book of Mindfulness. 2014. Buddhaimonia ZEN FOR EVERYDAY LIFE. [ONLINE] Available at: http://buddhaimonia.com/. [Accessed 12 June 2016].